The South, Yellow, and Alcovy Rivers empty into Lake Jackson, converging to form the Ocmulgee River, which then flows south and east to converge with the Oconee River to form the Altamaha River, which empties into the Atlantic Ocean at Darien, Georgia. The South River watershed is located in the Upper Ocmulgee River Basin. It is composed of 155,239 acres and includes portions of DeKalb, Fulton, Rockdale, Clayton, and Henry counties. The Yellow River stretches from suburban Gwinnett County outside of Atlanta to the south, draining portions of DeKalb, Rockdale, and Newton Counties before entering the backwaters of Lake Jackson. True to its name, the Yellow runs high in sediment, resulting in a water color from light to greenish brown. The Alcovy River originates in Gwinnett County, near Lawrenceville, Georgia. It flows south, eventually emptying into the northern end of Lake Jackson along the Jasper/Newton County border. The diverse fish fauna of the Ocmulgee River basin includes 105 species representing 21 different families. The carp and minnow family, Cyprinidae, is the largest family in the basin with 27 species. The sunfish family, Centrarchidae, is th second largest family in the basin with 22 species. The Ocmulgee River Basin contains 1 species of catfish. 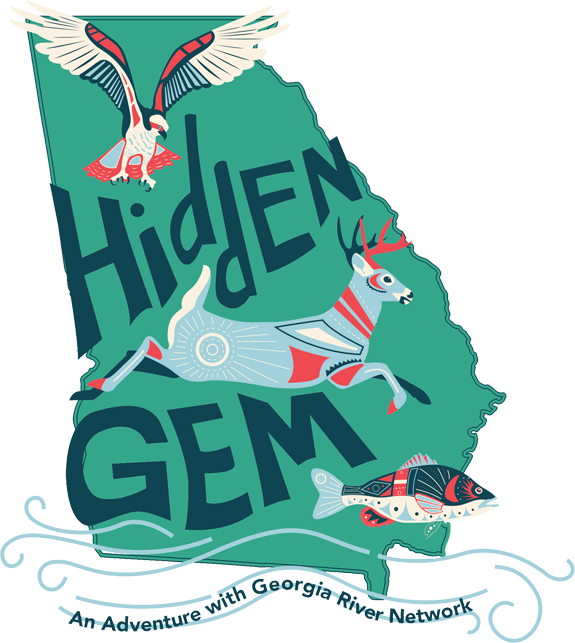 According to the state list of protected fish species, the Ocmulgee River Basin is home to one endangered species (Altamaha shiner, Cyprinella xaenura) and two rare species (goldstripe darter, Etheostoma parvipinne, and redeye chub, Notropis harperi). In the Ocmulgee River Basin, there are approximately 120 community public water systems utilizing surface water and groundwater. Municipal and industrial water demands include public supplied needs such as residential, commercial, governmental, institutional, manufacturing, and other demands. NPDES Discharges: As of 2018, there are approximately 140 facilities, including industries and municipalities, authorized to discharge wastewater into the Ocmulgee River Basin pursuant to NPDES permits. There has been a relatively steady increase in permitted agricultural water use in the Ocmulgee River Basin from 52.61 million gallons per day (MGD) in 1980 to 106.54 MGD in 2000. As of 2018, the EPD had issued 2,594 agricultural water withdrawal permits in the Ocmulgee River Basin. Georgia Power Company operates its fossil-fueled Plant Scherer by withdrawing water from the Ocmulgee River and Lake Juliette in the Ocmulgee River Basin. Small impoundments in the basin, which are all low head hydroelectric projects, include Lake Tobesofkee on Tobesofkee Creek, the Porterdale impoundment on the Yellow River, the river industrial impoundment on the Yellow River, the Panola Shoals impoundment on the South River, and the High Falls impoundment on the Towaliga River. Lloyd Shoals Dam, which forms Lake Jackson, is a Georgia Power Company facility. East Juliette Dam is operated by Eastern Hydroelectric Corp. (Eastern Hydro) for the production of hydroelectric power. In October 2014, the Federal Energy Regulatory Commission revoked Eastern Hydro’s license to operate the facility and ordered the owners to permanently disable the powerhouse at the dam. The dam will also have to be removed. Forestry is a major part of the economy within the basin. According to the U.S. Forest Service, there are approximately 4,188,700 acres of commercial forest land contained in the entire counties that are within the basin representing approximately 60% of the total land area. Private landowners account for 82% of the commercial forest ownership while the forest industry companies account for 14%. Agriculture in the Ocmulgee River Basin is a varied mixture of animal operations and relatively intensive commodity production. Agriculture land comprises some 19% of the land use within the basin. The Ocmulgee River Water Trail encompasses approximately 200 miles of water trail stretching from Macon to the river’s confluence with the Oconee River near Lumber City, which then forms the main stem of the Altamaha River. For more information, visit https://www.garivers.org/ocmulgee-river-water-trail.html.The Yellow River Water Trail stretches 53 miles from suburban Atlanta to Lake Jackson, with put-in and take-out points located approximately every 5-10 miles. For more information, visit https://www.garivers.org/yellow-river-water-trail.html. Little Ocmulgee State Park and Lodge: Conveniently located off Highway 441 in South Georgia, this park features a wide variety of amenities, including an 18-hole golf course, a splash pad for children, and a 2.6-mile trail that takes hikers to a short boardwalk, a campground, rental cottages, and a 60-room lodge. Ocmulgee National Monument: Located in Macon on the Ocmulgee River, the Ocmulgee National Monument is one of Georgia’s most popular tourist attractions. The Monument features Native American mound structures from hundreds of years ago as well as hiking trails and walking tours. For more information, visit www.nps.gov/ocmu. Mile Branch Park in Hawkinsville: A 25-acre waterfront park located just south of Hawkinsville, Mile Branch Park features a number of hiking trails, camping facilities and a boat ramp on the Ocmulgee River. In the Ocmulgee River Basin, there are approximately 150 rivers and streams listed on the 2012 integrated 305(b)/303(d) list as waters not supporting their designated uses. These impaired waters include roughly 1,015 miles of rivers and streams in the Ocmulgee River Basin. Archaeologists have collected evidence of an unbroken chain of civilization in the Ocmulgee River Basin dating from the Ice Age migration of humans across North America. Europeans first reached the Ocmulgee River in 1540, when Spanish explorer Hernando de Soto’s expedition came to Ichisi, a late Mississippian chiefdom that archaeologists now locate on the floodplain south of Macon. In the eighteenth and nineteenth centuries, wagon and stagecoach trails followed the old Indian trails along the Ocmulgee River, linking settlements and frontier forts like Fort Hawkins along the east bank.